I’m a firm believer in the 2nd Amendment! If you’re not a believer, please reconsider the true facts. This is history; not what’s being shown on TV, sanctioned by our illustrious delusional leaders in Washington. PLEASE DON’T THINK FOR A MOMENT, THAT THIS COULDN’T HAPPEN IN OUR COUNTRY ALSO!!!!!! · From 1939 to 1945, a total of 13 million Jews and others who were unable to defend themselves were rounded up and exterminated. · From 1948 to 1952, 20 million political dissidents, unable to defend themselves, were rounded up and exterminated. You won’t see this data on the U.S. evening news, or hear politicians disseminating this information. SWITZERLAND ISSUES A GUN TO EVERY HOUSEHOLD! SWITZERLAND’S GOVERNMENT ISSUES AND TRAINS EVERY ADULT IN THE USE OF A RIFLE. SWITZERLAND HAS THE LOWEST GUN-RELATED CRIME RATE OF ANY CIVILIZED COUNTRY IN THE WORLD!!! We were unable to determine who the actual author of this piece was, initially. If anyone knows who was the original author please send that info along so that we can appropriately credit this piece. December 29, 2012 marked the 122nd Anniversary of the murder of 297 Sioux Indians at Wounded Knee Creek on the Pine Ridge Indian Reservation in South Dakota. These 297 people, in their winter camp, were murdered by federal agents and members of the 7th Cavalry who had come to confiscate their firearms “for their own safety and protection”. The slaughter began AFTER the majority of the Sioux had peacefully turned in their firearms. When the final round had flown, of the 297 dead or dying, two thirds (200) were women and children. Apparently there are still a few public officials who will honor the Constitution left in the House of Representatives. Many of these representatives recognized the threat to the second amendment inherent in the UN Small Arms Treaty. This treaty, which the president has indicated he would sign, bypassing congress and ratification by the states, is intended to be handed back over to the Secretary of State to implement by agency decree and imposed upon the states. While being sold to the public as simply a guideline for limiting the sales of small arms to the same countries we are many times waging war with, the treaty would severely affect the sale and ownership of small arms i.e., private gun ownership, here in the states. 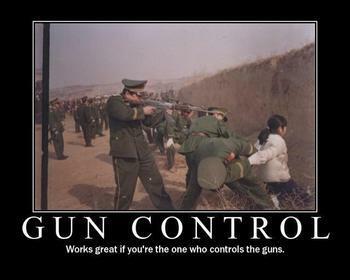 The obvious end goal included in many other global goals, is the disarmament of US gun owners. The UN Small Arms treaty is nothing more than the effort to end all gun ownership anywhere in the world, except those weapons used by the military forces around the globe. With the UN attempting to gift itself the right to construct its own military with an eye on becoming the only military force on the planet, our right to keep and bear arms is more important than ever. The Small Arms Treaty will not slow down or even minimally impact the arms trading and dealing that is conducted globally.